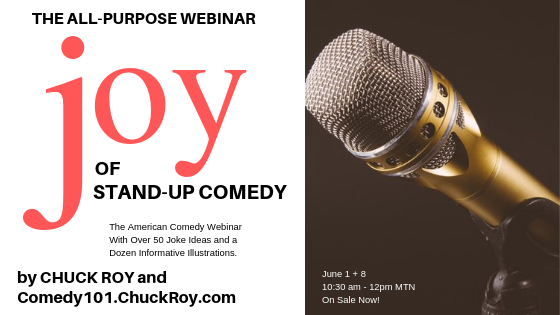 After successfully completing the Joy of Stand-up Comedy webinars you will understand why adding joy to my performances helped me book 2 TV Shows! Get my secrets to successfully improving stand-up comedy routines. Practice delivering your jokes with joy! Plus, develop your recipe for show business success. Get my secret recipe for stand-up comedy success! Organic premises for joyful laughter. Herbal remedies for joke writing. Comedy show business tips that let you have your cake and eat it too! 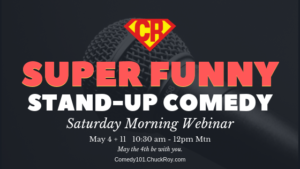 Chuck hosts this webinar to connect you with the latest tips and professional advice that helps you deliver stand-up comedy with more joy! 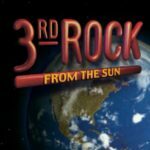 Get opportunities to try new techniques that could get you on television! 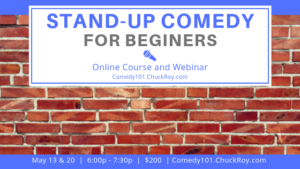 Learn secrets to creating super funny YouTube performances. 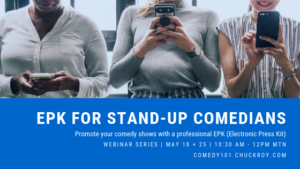 This webinar is designed for professional comedians that want to improve their TV performances. 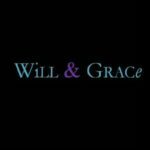 Amateur comedians that want to crush their YouTube video recordings. Open mic comedians that want new techniques that deliver oustanding comedy. Public speakers with a strong desire to be more joyful in their performances. Webinar attendance is limited! Get your ticket now!